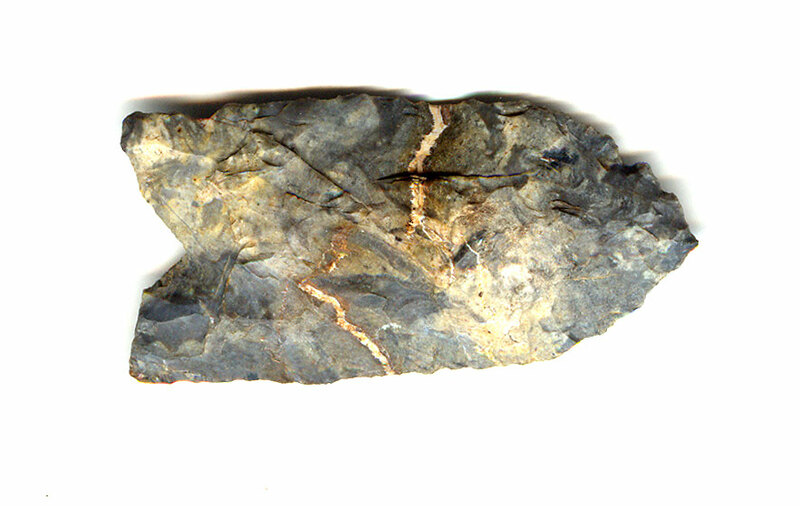 A Small Size, Thin, Very Colorful, Visibly Aged And Anciently Use Sharpened, Nicely Made Clovis Point That Exhibits Stone Aging Oxidation And Surface Coloration Patination, Correct Rolled Basal Stem Edge Hafting Dulling, Consistent Aged Surface Deposits, Aged Stained Hinge Deposits, Correct Early Style Blade Flaking, Correct Blade Sharpening Use Reduction, Correct Material And Manufacture For The Area Found. Ex-Patrick Gaines Collection. The V Shaped Base, Was Possibly Caused By The Original Haft Removal, Then Later Anciently Chipped To The Concave Style Base For Further Use. Includes Dwain Rogers And Ken Partain Certificates Of Authenticity.